1. 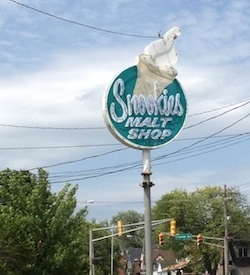 Snookies Malt Shop is located in the Beaverdale neighborhood of Des Moines. It is only open during the summer—from about mid-April to early fall. This place has been open since the 1950’s and has a retro feel. You order at the outdoor counter (or drive-thru) and then can sit inside or outside. Their outdoor seating is fun and different—we chose to sit on the four-seated glider and that automatically brought a smile to my four-year-old’s face. The menu consists of soft serve ice cream, made into shakes, sundaes, cones, arctic blasts (ice cream with candy mixed in) and more! They add an animal cracker or little cookie to the top of their treats and you can even have a free pup cone if you bring your dog. Just make sure you bring cash, as they do not accept credit cards. 2. 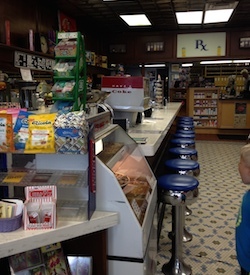 Bauder Pharmacy is home to an old fashioned soda fountain, serving homemade ice cream and drinks in original Coca Cola glasses. We had SO much fun here! This store opened at the Ingersoll Avenue location in 1925 and you can just feel the nostalgia when you walk in. The kids loved sitting at the counter on stools and watching …. Besides the unique atmosphere, the ice cream is really good. They have a wide variety of treat options, featuring about ten flavors of ice cream, including FRESH strawberry and peach. They also make peppermint bars, which consists of Oreo crusts, with peppermint ice cream and hot fudge in the middle. Go there. Now. 3. Over the Top lives up to its name with 35 ice cream flavors. And these aren’t just vanilla, chocolate, strawberry basic options. The flavors here include sweet ‘n salty pretzel, white chocolate raspberry, cookie monster (five types of cookies inside), and coffee toffee chunk. At the other two shops deciding what to order was relatively easy for the kids. This one took time. Like we stood there and sampled about ten flavors before deciding. Two days later and the kids are still riding the sugar high. But it is worth it and the store is spacious with indoor and outdoor seating, along with a drive through. You can watch the ice cream being made through a glass picture window and they offer tours for groups. This ties in perfect with their party room which can hold about 24. I think I know where to host our next birthday party! One more spot worth adding to your list is Picket Fence Creamery. 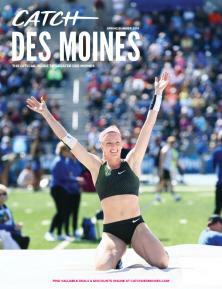 It is a family owned farm and store in Woodward (about 25 minutes from Des Moines). They have regular store hours where you can purchase fresh milk, cheese, ice cream, beef and pork. Literally straight from the farm!! They also have a fun, once a month, event called Sample Sunday. The next one is July 13th. You bring the whole family out to try great Iowa products like fresh sweet corn, pies, wine, pulled pork and ice cream. There are fun activities for the kids like meeting a calf, decorating sugar cookies and balloon animals.